Nancy was an only child, but the fact that she had neither sisters nor brothers had never tended to make her selfish. She was generous to a fault, and probably was the most popular young person in River Heights. So Nancy is popular. That means people think that hanging out with her would be delightful. Pleasant. Fun. But that’s the perception of the general public. What do the people who truly know Nancy think? Is she fun on a date? Let’s see what her “special friend” Ned Nickerson has to say in The Secret of the Wooden Lady. “What happened to you, Ned?” Bess asked with concern, looking at his bandaged face. “One hour with Nancy Drew and I’m in combat,” Ned said, grinning. What’s she like on a girls’ day out? In The Clue in the Crumbling Wall, for instance, does she plan fun activities? 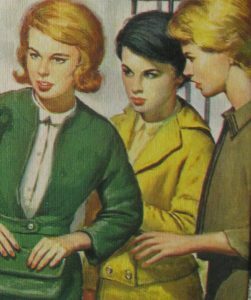 “Let’s wear old clothes next time we go to Heath Castle,” she said to Bess and George, as the girls parted company in River Heights. “And take along snake serum, axes, and lunch,” advised George pointedly. Well, surely, she’s a delightful daughter to have around. I mean, our parents have to enjoy our company. Don’t they? Let’s see what Carson Drew says in The Clue in the Crumbling Wall.